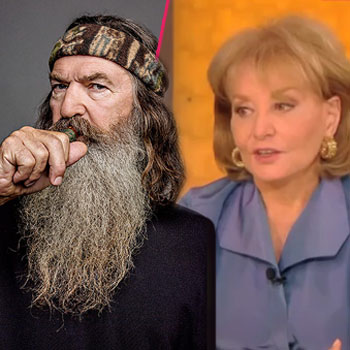 Duck Dynasty’s Phil Robertson reportedly snubbed Barbara Walters in a recent interview, opting to go duck hunting instead. Phil Robertson, 67, was supposed to accompany the rest of his family for a taped interview of Barbara Walters’ Most Fascinating People of the Year special. The Robertsons made Barbara Walters’ annual list along with actress Jennifer Lawrence, singer Miley Cyrus, and reality star Kim Kardashian, among others. In a sneak preview of the transcript from the interview, set to air Wednesday, Barbara Walters asks Phil Robertson’s wife, Miss Kay, if her husband would rather go hunting than sit down for the ABC network interview. “Tell him I have never been superseded by a duck before,” Barbara Walters quipped. The Robertson clan went on to tell Barbara Walters that this isn’t the first time Phil has skipped out on a big family event to go duck hunting. Jessica Robertson, Jep’s wife, told Barbara Walters that Phil missed the birth of his son, Jase, because he was busy sitting in a duck blind. “Well, he missed the birth of Jase because he was in the duck blind, and he wouldn’t leave,” Jessica Robertson explained.